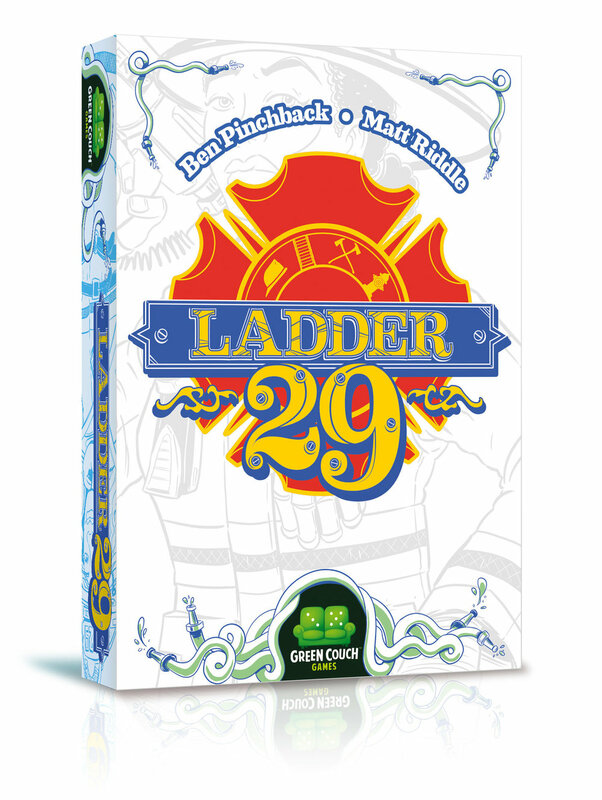 Ladder 29, by Matt Riddle and Ben Pinchback (Fleet, Eggs and Empires, Wasteland Express Delivery Service), is a hot game of ladder-climbing firefighters. As experts in the time-honored business of firefighting, players attempt to extinguish their hand of cards while facing difficult challenges that hinder their abilities and choices. Players must decide when to play it safe and when to put it all on the line in this easy-to-learn game that is sure to turn up the heat around the gaming table! Ladder 29 is played over several rounds in which players are dealt 13 cards each, pass three cards to the player on the left, then in reverse scoring order select a Hot Spot Card; this card details the number of points awarded depending on the position the player goes out and a challenge that applies only to that player for the round. A player may choose to only lead singles, end runs in even numbers, or even limit the types of suits played in sets. The bigger the risk taken, the bigger the potential reward. The first player to extinguish their hand by playing all thirteen cards wins the round and earns the most points possible on their Hot Spot Card. Play continues until additional players go out, with all except the one who goes out last earning points for their finishing position.